The presence of these relics among us today is a unique occasion. Just as last month we celebrated Joachim and Anne as the parents of Our Lady, so today we welcome back the Saint of the Little Way – and the parents who moulded her heart to love the Lord. The Little Way was the product of a big heart. Big loud ideas are not necessarily the product of big hearts. Therese and her mother lived comparatively short lives. 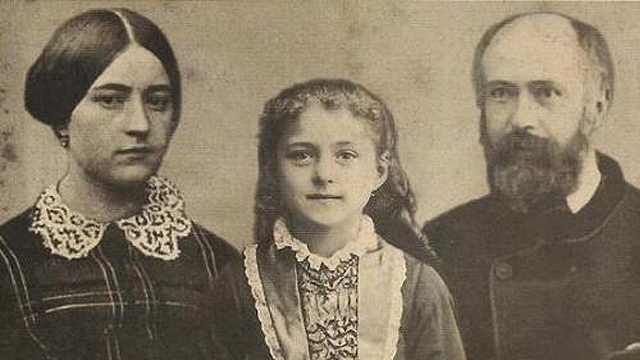 Zelie, the mother of nine children, died of cancer at 45, when Therese was just over four. Therese herself died at 24. On the other hand, Louis lost his four siblings by the time he was 30, buried his wife when he was in his early 50s, buried one daughter and lived till he was in his early 70s, despite having to deal with the result of two paralysing strokes for the last 6 years of his life. Since all his five daughters entered the convent, Louis and Zelie had no grandchildren. These are modern saints. Their path to sanctity was not an easy road. It can be hard to see God in cancer, tuberculosis and four children dying in infancy. Many modern families and individuals have to live with sudden death, cruel illnesses and the loss of too many children through accidents, at the hands of others or at their own hands. The difference nowadays is that we do not swim in waters which assume that there is a God in heaven who gives meaning to life on earth. The air we breathe tells us that life is for fun and ultimately not of any great significance. The culture suggests that relationships should not be relied on to provide too much support. The expectation for young people is that they should have ticked some things off their 'to-do-list' by the age of 24, not that they should have aimed to become saints. The big way that leads to Australia and Thailand, Latin America and bungee jumping is marketed as being so much more valuable that the Little Way that leads to sanctity. So it is a blessing to have these relics among us as we prepare for the World Meeting of Families next week. These saints remind us that holiness is won from the hard rock of life by those who are prepared to take up their cross. Sanctity is possible for those who see their lives as a vocation to greatness and not merely as a series of personal self-centred short-term choices. That was how Therese, Zelie and Louis were formed by faithfulness to their vocation, despite all the painful experiences of their family life. We might pray during this visit, not just for special roses from heaven for our individual needs but also for a renewed sense of the vocations to married and family life, and to religious life and priesthood. Those were the priorities for the saints who have come among us. They would ask us to learn from the simple faithfulness of their lives and not just to twist their arms for favours. They found their peace within the strange ways of the Lord as we all have to. They would invite us to discover the seeds of sanctity within our lives, whatever our circumstances may be.